New graduate students listen to School representatives about what to expect from the College during their grad years. 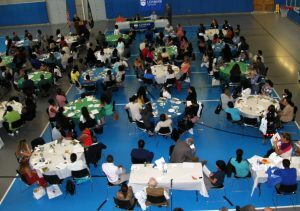 New graduate students and faculty and staff mingled over sandwiches and mixed salads at the College’s first luncheon and reception for grad students on Tuesday afternoon in the APEX. During the luncheon students received some friendly advice from President Ricardo R. Fernández, Director of Admissions Laurie Austin, and representatives from each of the Schools. This fall, the College welcomes some 600 new graduate students, representing the full spectrum of disciplines from biological sciences to social work to special education and speech-language pathology, and more. The daylong event featured intimate library and information technology workshops, and one-on-one time with faculty experts and advisors, culminating with a reception in the late afternoon. During the luncheon, students heard from School of Arts and Humanities Dean Dierdre Pettipiece, who shared her own struggles as a graduate student raising two children on her own while working as a fork-lift operator. Her advice to students: get to know one another because they would need each other’s support once workload picks up. Harriet-Fayne, dean of the School of Education, recommended students check their school e-mail and the College website for important announcement and news. Representing the Schools of Natural and Social Sciences and the new School for Health Sciences, Human Services, and Nursing was Prof. Carl Mazza, chair of the Department of Social Work. He instructed students to hone their time management skills in order to keep up with the pace of the program. “Overall, the event was well received by the students and our faculty participants, and I’m looking forward to making this a new tradition at the College,” added Austin.